Two ritual killers from Nasarawa State who beheaded a 7 year old boy, identified as Samu Danjuma, after a promise of N250, 000 by their prospective buyer are cooling their heels in the cell of the FCT command of the State Security Service (SSS). The men, John Yakubu a.k.a Tambaya and Ishaya Dakulung were said to have hatched a plan to make quick money when a third accomplice, one Bamayi, assured them that they would make money if they could get a fresh human head. The two suspects, according to SSS, were arrested last Sunday at about 1:30 am along A.Y.A junction of Asokoro District of the Federal Capital Territory (FCT) Abuja, following a tip off. Assistant Director, Operations of the Service, Ibrahim Halidu, while parading the suspects narrated that “On July 22, 2012 at about 0130hrs at A.Y.A Asokoro, operatives of this Service arrested two suspected ritual killers with a fresh human head of a seven year old who was later identified as Samu Danjuma. “They were arrested while they were looking for a buyer, following a tip-off. “The Service has commenced investigation in order to prosecute the duo in a court of law”, Mr. Halidu stated. The two suspects both Gbagyi by tribe admitted committing the crime and disclosed that their victim was a neighbour’s son in Agwa Galadima community, new Karshi of Nasarawa State. John Yakubu alias Tambaya, 25, disclosed that he lured Samu to a stream in their community with a loaf of bread. According to him, when they got to the stream, he tricked Samu to join him in the water, where he strangled and cut his neck off. He said after collecting the head he disposed the body in the stream where it was swept away. Speaking through an interpreter, Yakubu disclosed further that it was Ishaya Dakulung, 30, married with six children that sent him on the deadly mission and added that their client wanted a seven year old boy’s head for a hand sum financial reward. But Ishaya who claimed to be a bricklayer, said that it was Tambaya that brought the head to him to look for a buyer, and said that it was his first time of dealing in human parts. 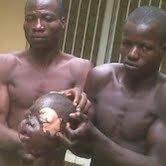 Ishaya further alleged that on the day they were arrested, a man in Abuja city contacted him to bring the human head for him. “The man promised that if he sees it, he will give me N250,000. It was when we were going to deliver the thing that SSS arrested us”, Dakulung said.